Following the exploration of the circulation of metrics in the previous chapters, this chapter focusses upon the way that these circulating metrics define what is possible and what is seen to be possible. 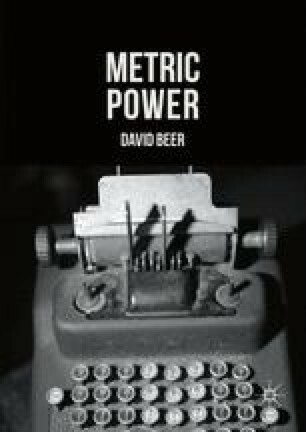 The argument of this chapter is that it is by defining possibility that metric power becomes embodied and instantiated. The chapter explores the relations between metrics and possibility on four fronts. First, it looks at the role of metrics in defining inequality. Second, it looks at the roles of metrics in defining what is seen to be of value or worthwhile. Third, it explores the role of metrics in defining what is visible or invisible. And, fourth, it discusses the ways in which metrics are used to imagine futures through visions of possibility (rather than just probability). The chapter concludes by suggesting that these four fronts are crucial in understanding how circulating metrics become active in the performance of the social world and its limits.